SWBAT use models to explore how human activity can change temperatures over time. Can changes in human activity result in a cooler planet Earth? How can scientists predict future climate change? Students and adults alike are skeptical about climate change. They often hear conflicting reports about our planet's future climate. Learning more about how scientist build and use models to make predictions will help students develop the understanding they need to make informed decisions as adults. 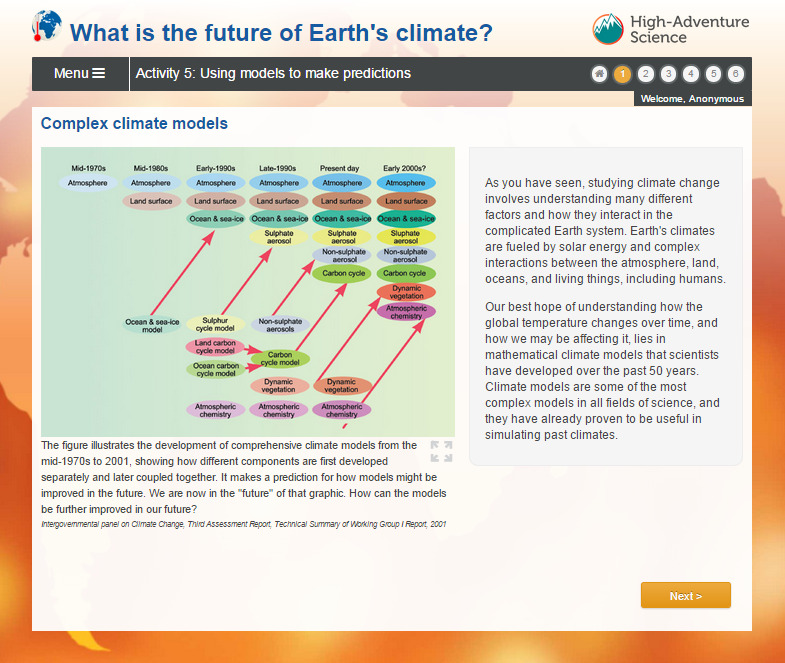 The High-Adventure Science - Activity 5 Using Models to Make Predictions presents to students a short written explanation along with an interactive simulation for students to examine and analyze. Boxes are provided for students answers. As the facilitator of this activity, I can run a report at any time to view student responses for all students, one student, all questions or one question. "Using Models to Make Predictions" High-Adventure Science. Concord Consortium, 2015. Web. 23 May 2015. I begin this lesson by asking students - How do you think teachers and parents determine whether or not you will be successful next year in school? If you are successful this year, then you should be prepared and will experience success next year. So if we have a good understanding of the past, then we can use that understanding to predict the future? Yes, sometimes. Other things might happen to change the future. If all other variables remain the same then can we say the past is a good indication of the future? Can you share an example of how we predict the future from our past experiences? Yes, in Indiana we know that the summer will be hot and humid because summers are always hot and humid in Indiana. In this module you will take a closer look at models created and used by scientists for predicting future climate change. In each of the simulations, I find keys questions that I can use to get a good sense of student understand. In this video, I share my go to questions. I simply ask students to reflect upon their contribution to the increased levels of CO2 in the atmosphere? What can you personally do to reduce your footprint? We do not have to answer that question today - keep it in the back of your mind. Ask yourself if a choice you are making will contribute to an increase or decrease in our global temperature.